A number of items are not allowed to be brought into the Kingdom due to religious reasons and local regulations. These include alcoholic beverages, pork and pork products, prohibited drugs and narcotics, firearms, explosives, edged weapons and pornographic materials. 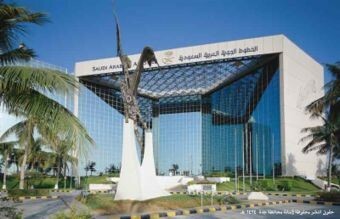 Saudi Arabian Airline's headquarters in Jeddah. Comments: (1) I am grateful to primerprez at "PRIMER-Connecticut" (where PRIMER stands for "Promoting Responsibility in Middle East Reporting") for pointing out this change in an Aug. 29 posting, "Our Saudi 'Friends' Respond to Criticism." (2) As primerprez puts it, the Saudi leaders "appear to have responded amazingly quickly to criticism from Daniel Pipes." PRIMER seeks improved reporting on the Middle East. (3) Dropping the offending paragraph would be very welcome if it indicated a shift in policy by the Kingdom of Saudi Arabia, one that now permits "Bibles, crucifixes, statues, carvings, items with religious symbols such as the Star of David." It is less welcome if it merely cleans up the Saudia act for the outside world, as primerprez speculates is the case: "I doubt the Saudis have actually changed any of their obnoxious policies; they're just not publicizing them on the Saudi Arabian Airlines web site." Allowing non-Islamic artifacts into the kingdom is too momentous an issue to be conceded without a fight. Nor would such a change happen so suddenly, within a week. The remaining "Customs Regulations" paragraph retains a more general, and therefore less offensive statement of this same restriction ("A number of items are not allowed to be brought into the Kingdom due to religious reasons"), indicating that the old policy clearly remains unchanged and in place. (5) The decision to drop the second paragraph on customs restrictions points to the Saudi sense of vulnerability, which is not a total surprise. It's a demographically small state surrounded by predators (Iran in particular), dependent on the income of one fickle commodity. It hardly needs added complications in its relations with the U.S. and other Western governments. (6) My call of a week ago to "unite to exclude Saudi Arabian Airlines" remains in place. As I put it then: "Western governments should demand that unless the Saudi government at least permits 'that [religious] stuff' in, Saudia faces exclusion from the 18 airports it presently services in Europe, North America, and Japan." Saudia's access to those airports remains a weak spot that begs to be used as a mechanism to help bring a first step toward religious tolerance in Saudi Arabia. Aug. 31, 2008 update: Looking at the Saudia website a year later finds the offending paragraph reinstated. Indeed, its removal did not amount to much, just some temporary damage control.